I've always had a healthy respect for water and the concept of going down a river sitting precariously on the edge of a rubber contraption didn't really warm the cockles of my heart, but I thought..hey..what the hell, it's not everyday I get to be up close and personal with the Ganges. We left Delhi on the comfortable Shatabdi Express heading toward Dehradun. We got off at Haridwar where a taxi took us along stomach churning mountain roads to the rafting camp about 30 km north of Rishikesh. 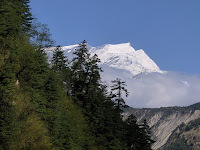 The beauty of the mountains and the beauty of the Ganga have to be seen to be believed. The unspoilt forests, the pristine water getting clearer the more upstream we went all gave us an overwhelming feeling of appreciation of why ancient sages and rishis called this place home. I actually felt like meditating here. We trudged down a sinewy path towards the camp site on the edge of the river. The Ganga looked serene and placid despite the flowing water. I couldn't help but wonder at the water that had been flowing through these same places for thousands of years. All the stories about the river from the ancient texts of the Mahabharatha and the Ramayana came flooding back to my memory. This was heaven! The next day, after some interesting experiences with the loo and a heavier than normal breakfast we started getting prepared for the rafting experience. We were given numerous instruction on paddling in different directions, why not to lose the paddle no matter what (each one costs about $25), and how to obey our raft guide no matter what. Probably, we took the last part too literally? We also had a gentleman in a Kayak who would be our guiding light, skillfully mastering the water ahead of us and providing us nuggets of information on what was coming up ahead. The first rapid, though scary to me, was supposedly a baby and though the raft went through some sickening direction changes, we were in calm waters in no time. After a few other rapids, we were quite comfortable with these every couple of kilometers or so. Apparently, there are different classes of rapids, Class I being a sissy and a Class VI something that would re-arrange all your internal organs. We were told that we would not encounter anything above a Class IV, which itself was not very assuring as most of the time, we were told what class the rapid was after we had screamed and yelled our way through it. The guide did tell us to wedge our feet under the big rubber cylindrical tubes that passed off as some kind of seats which were not allowed to use. We were all perched on the sides of the raft to allow us to paddle down the river and we made our way merrily down the river happily getting confused with every instruction that was being given by our guide. Invariably, we paddled forward when the guide asked us to stop and stopped paddling when he instructed us to paddle. As even such simple instructions befuddled us, one can only imagine the chaos when people on one side had to paddle in one direction and people on the other side in a another! Despite the minor hiccups, we did admirably well in general and were starting to get the hang of the whole thing. Each of these rapids has creative names associated with them. There's a history behind each name, though sometimes it was tough to map the explanation with the name. We came across Sweet Sixteen, Black Money, Cash Flow, The Golf Course and other such exciting rapids. During this entire nonchalant trip downriver, we were not given much detail on one such rapid called the ClubHouse. This was supposedly a good Class III which meant that it if one was to drill down into further classifications, it would be a 3.9997. As we approached the ClubHouse, there were some heated verbal exchanges between our guide and the kayaker. We heard something ominous from our guide which sounded like 'Thok dethe hain'. It didn't strike us until later as to what that meant but we were going to find out very soon. Again, blissfully we obeyed every instruction from our guide though the ClubHouse was giving us enough warning sounds of rushing water. When we finally were confronted with the deceptive sounding rapid, all I could say was 'Oh my God!!'. The ClubHouse does not kid around. It is a hole of about 6 feet deep though I was pretty sure it was about 50, the brief glimpse I saw of it. Right after this cavernous dip was a wall of water, probably about 10 feet high. We hit the ClubHouse dead center whereas all other rafts had gone around this behemoth. The lead paddlers, a friend of ours from Bangalore and a guy from Delhi (we met up with him in the camp) vainly tried to follow the urgent instructions of the guide who was yelling 'Paddle Forward Team'. The only problem is that we were paddling in thin air as we were unable to hit the water with our paddles. The Delhi guy, who was the lead paddler on the right, was gently smashed by the wall of water and he elegantly slid backwards taking another light weight lady(right behind him) into the water with him. As we lost significant weight on the right, the raft tilted to the left emptying us into the waiting arms of Mother Ganga. Only our guide was left in the back, bravely trying to keep the raft afloat. Ganga Maatha would have none of that and the raft promptly went up straight in the air and capsized right over him. In the meantime, I had hit the water so quickly that I was still paddling until I realized that there was no raft under me and I was in the freezing water of the beautiful river. I did remember the cost of the paddle and courageously clung to it. We had been told at the camp that, should we ever fall into the water, we were to point our feet downstream and float on our backs. The issue was that the Ganga had not been privy to this advice and try as I did to turn my body; I kept getting pushed down into the water and gracefully floated backwards. This probably was a good thing as I could not see the other rapids I was getting into and out of. At one point my head hit a rock but I had my helmet on so all I felt was a little thud. Life vests are named that for a reason and I was pleasantly surprised to find out that mine worked. I did manage to keep my head above water most of the time. At one point, I saw my pretty wife swim by at considerable speed which left me wondering what the rush was all about. Maybe there was a race going on that I was unaware of. Close on her heels was the kayaker. I signaled to him but he just waved back and I thought he must be racing with my wife who was going about 320 knots by now. As these casual thoughts went through me, I was reprimanded for my indifference by being dragged into a whirlpool. Mr. Eddy took me down about 7-8 feet before realizing I wasn't worth the trouble and started bringing me back to the surface. By this time I had drunk enough water to convert the good Class III rapid to a bad Class II (approx 2.0005). The kayaker finally decided that he should probably ease my misery and came up to me. I clung on for dear life on the kayak and he deposited me safely onto another raft that had stopped to witness the events and rescue us if given no other choice. Mind you, despite all these travails, I still had the paddle clenched in one hand, which I consider to be a remarkable achievement akin to the first moon landing. Once I was in the relative safe confines of our raft, I heard the other stories. My wife, after her speedboat imitation had been rescued by the kayaker. In fact, that's what he was trying to tell me, that he could not get to me as I was in the middle of a rapid, so he went after her. He did scare the living daylights out of her by aiming her back downriver so she had no idea what was coming. Our lady friend, the best swimmer of the lot figured out no one was coming to rescue her so she drove courage into the 220 pound, 6ft tall Delhi man who clung to her like a baby, and both swam to the shore. Our left side lead paddler had an interesting encounter with an allegedly racist kayaker who was unhappy with every position that was tried to cling onto the kayak. Our guide had deftly righted the raft and magically had brought it to shore. All in all, quite the interesting experience. I now have an even healthier respect for the water and bow to the Ganga in respect and gratitude for not making me a part of her forever. So, if ever someone wants me to go rafting on the Ganges again, I'm going to say.....hey..what the hell, it's not everyday I get to be up close and personal with the Ganges. Thanks for your comments. Means a lot to me. This is THE BEST article I've read in a long time!Awesome! But you forgot to mention the security guards one legged salute which started the whole thing!